The fast and furious forces of change stimulated by technology, demographics, lifestyles, and economic, environmental, political and regulatory impacts - or any number of these in combination - are easy to see. They are easy to talk about. They are easy to intellectualize. The problem? The answers are hard to execute and require nuanced combinations of leadership, skills, strategy and tactics. On top of that, innovation has moved from an abstraction that will matter at some distant date to a front-and-center deliverable that must show evidence of impact in the space of the calendar quarter. 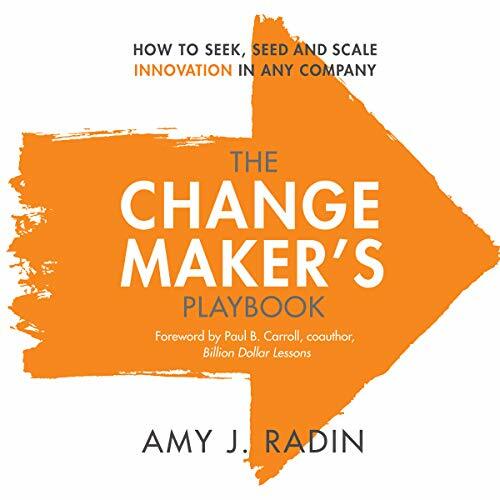 In the stories, tools, techniques and advice inside The Change Maker’s Playbook, leaders will find tangible steps to find and safeguard the plans that will deliver the sustainable business-changing impacts - new customers, new relationships, new sources of value and growth - their businesses need. The book walks listeners through Radin’s adaptive, 9-part framework, engaging them in ready-to-apply techniques. Her work shows leaders how to find the big ideas that will meaningfully address customer needs, take the insight from idea through implementation in a way that delivers in the short and long-term for the organization, and lead effectively through the obstacles that tend to derail or diminish innovation. Three phases - Seeking, Seeding and Scaling - organize the framework within an intuitive, logical and useable format, with concrete actions outlined every step of the way. The answer to the dilemma every business faces today is that innovation is exhilarating, rewarding and even fun when it is approached as a unique challenge, but it can also be polarizing, unpredictable, and scary. Success requires that leaders rethink how they lead innovation. Leaders know they must set aside preconceived notions of what works, and look to those who have already walked in their shoes. ©2018 Amy J. Radin, The Daily Innovator, LLC. (P)2018 Brilliance Publishing, Inc., all rights reserved. Old ideas rehashed with even less impact than the originals. The framework itself is not bad, it's just not new or original...more of a combination of innovation literature principles. This would be a useful read if you are completely new in the innovation space. The performance is terrible. The narrator has clearly not even browsed this book prior to recording, the intonation and pronunciation is incorrect. She often emphasizes the wrong words in the sentence and by doing so, removes what few impact full sentences would have existed in the book.